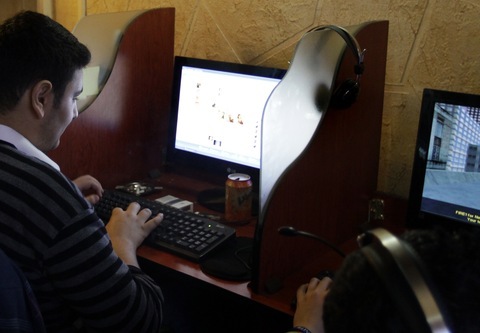 Syrians use computers at an internet cafe in Damascus on March 18, 2011. Photo by AFP/ Getty Images. It was less than two years ago, on January 28, 2011, three days into the Egyptian uprising, that President Hosni Mubarak’s government shut down the internet. Just two weeks later he was gone. Shutting down the internet is not just a desperation move. It’s a loser’s strategy. Yes, it makes it harder to for the opposition to communicate with one another, to organize demonstrations, to spread evidence on YouTube of a ruler’s atrocities — like video of children killed in bomb strikes — or footage of resistance successes, like shooting down a regime helicopter. What’s more, losing internet and also cell phone service — vital for voice and texting — is probably harder on the Syrian rebel army than it is on Assad regime forces, who have more satellite phones at their disposal, and probably a secure government internet or phone network for the top military brass. But in the big picture, Assad’s move may backfire as Mubarak’s did. When Mubarak cut the internet, he crippled the country’s major industries and businesses, the ones connected to the global economy. Those businesses — from oil to finance — were crucial to keeping Egypt’s economy functioning during what the regime hoped would be a passing protest phenomenon. Syrian business, while sputtering, is still generating revenue for Syria’s cash-strapped economy. Activists in Egypt simply fell back on traditional organizing: word of mouth, neighbor-to-neighbor, and at Friday prayers. They even distributed old-fashioned paper flyers on how to protect yourself against tear gas. The move also made independent satellite television more important. Egyptian State TV was broadcasting game shows, sports and hokey dramas. But right outside people’s windows and on their satellite TV channels — Al Jazeera, BBC and private networks — an alternative reality was unfolding. By the time Mubarak restored service five days later, Egyptians no longer needed to be on the internet to know what was going on — or the degree to which the state media was lying. The analogy isn’t perfect. Protestors in Egypt weren’t cowering under bombing from the air as Syrian civilians are. But Egypt teaches a powerful lesson. Technology doesn’t “make” a revolution — at least not after the initial stage. What keeps a revolution going is a citizenry turning against its government to such a degree that each new repressive step only makes them angrier.